There's been a lot of commotion lately about the New Israel Fund -- here on the blog, and all over Israel. The most recent incident can be traced back to the brutally lopsided, Goldstone report, written by Judge Richard Goldstone, who was described by Professor Alan Dershowitz, as "an evil, evil man; a traitor to the Jewish people." A soon-to-be-released report by the Zionist student group Im Tirtzu, which accuses the New Israel Fund of direct responsibility for the UN’s Goldstone Report on the IDF’s Gaza offensive last winter, is “just another in a series of attempts to quash freedom of speech in the human rights and civil rights community in Israel,” the NIF’s CEO Daniel Sokatch told The Jerusalem Post on Monday. According to the Im Tirtzu report, 92 percent of the Goldstone document’s allegations criticizing the IDF’s conduct came from 16 Israeli NGOs that received some $7.8 million from the NIF in 2008-2009 alone. Im Tirtzu members have begun a protest campaign to coincide with the release of the report, and on Saturday night they staged a mock rally of Hamas members outside the Jerusalem home of NIF chairwoman Naomi Chazan, a former Meretz MK. 92% of the information in Goldstone's report came from organizations funded by the NIF? The New Israel Fund (NIF) is the leading organization committed to democratic change within Israel. Since 1979, NIF has fought for social justice and equality for all Israelis. We believe that Israel can live up to its founders' vision of a state that ensures complete equality of social and political rights to all its inhabitants, without regard to religion, race or gender. Or, basically, the eradication of any Jewish character of the State of Israel? 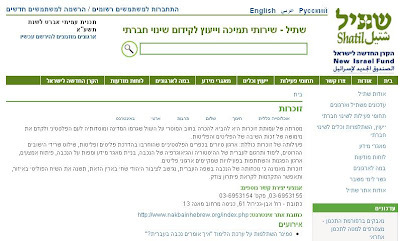 I'll admit, reading the NIF's English website, it sounds like an organization dedicated to social justice, ecological preservation, helping women, elderly, the poor and downtrodden...even religious Zionism...all very crunchy granola, nothing too radical...in fact they sound like the support lofty and worthwhile organizations. Yet on their website, they also support the most radical of left-wing ideologies in Israel. Proudly showing off their New Israel Fund funding logo, Zochrot is dedicated to "raising consciousness of the moral bankrupcy caused by the tragedy of Israel towards the Palestinian Nation, and advancing the right of return for the refugees." The "right of return" is a code word for the eradication of Israel as a Jewish State, because an influx of a few million Palestinians would radically change Israel's demographics. And all Funded by the NIF (Yet for some odd reason, I could find no mention of the radical Zochrot organization on the NIF English website. Could it be that NIF is hiding some of the more radical elements of its agenda from Jewish donors abroad?). Who else does NIF fund? Machsom Watch. An organization dedicated: To protect the human rights of Palestinians in the Territories and work to end the Occupation. Ilam: To challenge discrimination and promote equality for the Palestinian population in the Israeli media; to strengthen the media as a tool for internal Palestinian discourse and to ensure the Arab public's rights to appropriate media coverage and its integration into media activities. Note: Ilam isn't referring to Palestinians in Gaza and the West Bank -- they are referring to Israeli Arabs, citizens of Israel, as the Palestinian population. Promotes the collective social and economic rights of Palestinian citizens in Israel and promotes their participation in decision making. Responding to all these allegations, the Knesset's Constitution, Law and Justice Committee voted Wednesday to appoint a special subcommittee to inquire into the matter of contributions to Israeli NGOs from foreign governments and organizations. The decision comes after research by the Im Tirtzu movement, which found that the New Israel Fund finances most of the Israeli NGOs which testified against Israel in the Goldstone Committee. Now, if you take these radical ideologies supported by the NIF, and add to that that NIF sponsored organizations that contributed 92 percent of the Goldstone document’s allegations, then you have to decide whether the NIF is really pushing for the agenda you believe in. Unless of course, you believe that Israel does not have the right to defend itself against Hamas terrorism. Or if you believe that the IDF intentionally shelled women and children in Gaza. Or if you support the Palestinian "Right of Return." Or if you believe that Israel should not be a Jewish State. And yet...while NIF believes in civil liberties and freedom of speech for all -- and that Israel and the IDF should be investigated by Richard Goldstone -- they believe there is only one body that may not be investigated at all, and is above reproach. Your post reads like a smear campaign. the use of the term "palestinian nation" by Zokhrot already demonstrates the propagandistic nature of the group. There never was a "palestinian nation" in all history. The PLO in its charter [Article I] states that: The palestinian Arab people is a part of the Arab nation and palestine is an unseparable part of the Arab fatherland. by using the terms "palestinian people" or "palestinian nation," one collaborates in Western propaganda against Israel. You ought to know that the NIF gets some $20 million bucks per year from the Ford Foundation which is an ultra-Establishment US operation.